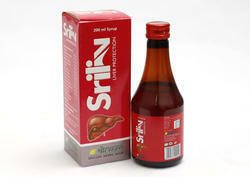 Sriliv syrup restores the functional efficiency of the liver by protecting the hepatocellular regeneration. The anti-peroxidative activity of sriliv prevents the loss of functional integrity of the cell membrane. It facilitates rapid elimination of acetaldehyde, the toxic intermediate metabolite of alcohol metabolism and ensures protection from alcohol-induced hepatic damage. 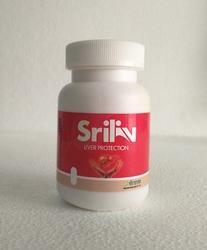 Sriliv diminishes the activity in chronic alcoholism and prevents fatty infiltration of the liver. In pre-cirrhotic conditions, sriliv arrests the progress of the disease and prevents further liver damage. As a daily health supplement, sriliv improves appetite, the digestion and assimilation processes and promotes weight gain. Dosage Take 2 teaspoonful 2 - 3 times a day or as prescribed by your physician. Dosage: take 2 teaspoons 2 - 3 times a day or as prescribed by your physician. Sriliv capsules restores the functional efficiency of the liver by protecting the hepatocellular regeneration. The anti-peroxidative activity of sriliv prevents the loss of functional integrity of the cell membrane. It facilitates rapid elimination of acetaldehyde, the toxic intermediate metabolite of alcohol metabolism and ensures protection from alcohol-induced hepatic damage. Sriliv diminishes the activity in chronic alcoholism and prevents fatty infiltration of the liver. In pre-cirrhotic conditions, sriliv arrests the progress of the disease and prevents further liver damage. As a daily health supplement, sriliv improves appetite, the digestion and assimilation processes and promotes weight gain. Dosage take 1 capsule twice a day or as prescribed by your physician. Dosage Take 2 capsules twice a day or as prescribed by your physician.